If you are a diligent motorist holding the steering wheel in the 10 o’clock-2 o’clock or 9 o’clock-3 o’clock positions just the way your driving school instructor taught you, you could be at risk of fatigue and potentially greater harm in an accident. In a study, published in the Institute of Electrical and Electronic Engineers Sensors journal, IIT Madras scientists have concluded that during long-distance drives, holding the steering wheel in the 8 o’clock-4 o’clock position causes the least risk of muscle fatigue and other injuries to drivers. There is no universal agreement on recommendation on hand position on a steering wheel. “Hand position varies among drivers across the globe. It depends on their training and habit of driving. Most accidents happen due to fatigue. 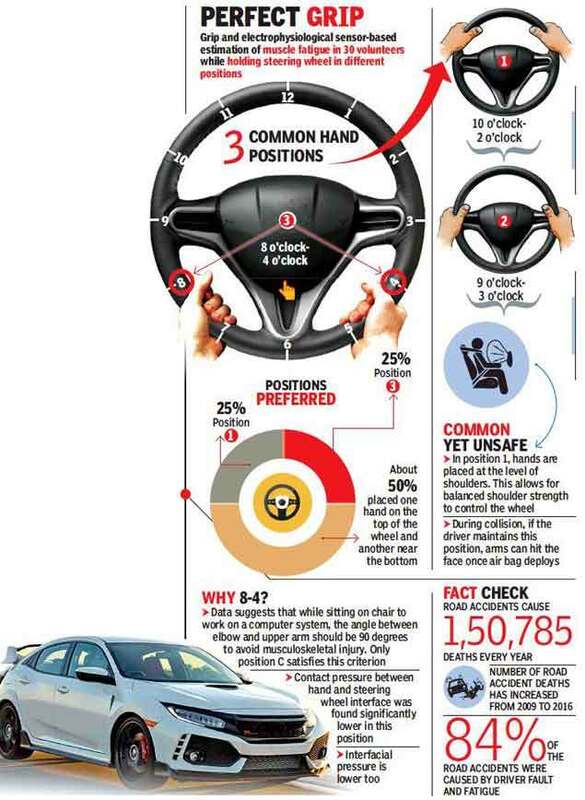 We wanted to see how much holding the steering wheel in the wrong position contributes to it,” said department of engineering design professor Venkatesh Balasubramanian, also adviser to the government for the TN accident and emergency care initiative. During the study, 30 volunteers participated in simulated driving for an hour. They held steering wheel in multiple positions using interfacial grip pressure sensors and electrophysiological sensors — surface electromyography. Nearly half of them placed one hand on the top of the wheel and the other on the bottom. About 25%preferred the 8 o’clock-4 o’clock position while the rest went for the 10 o’clock-2 o’clock position. The position did not change while facing accidents or changing lanes, but changed with speed and traffic volume. Most volunteers shifted hands to the lower part of the wheel. After analysis, scientists found that the rate of onset of muscle fatigue was less while using the 8 o’clock-4 o’clock position as compared to other positions. Interfacial pressure of the handgrip on the steering wheel was also better in this position and there was uniform loading on the palm. “This can reduce accidents due to fatigue. An added advantage of using the position would be the expected reduction in hand injuries during airbag deployment,” said Rahul Bhardwaj, co-author of the paper.